Ashington got that winning feeling back at Woodhorn Lane on Saturday with a thoroughly deserved victory as they put Buildbase FA Vase hopefuls Sunderland RCA to the sword. Steve Bowey’s side can now move on after a two months period where despite good performances, some results have suggested otherwise. It was back in mid October when the Colliers recorded their previous success after travelling to Lancashire in midweek and crushing Nelson 5-0. 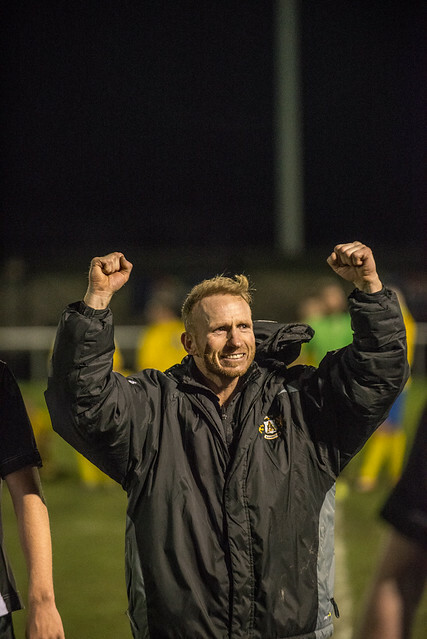 Since then, eleven games have gone by including exits in the Techflow Marine Northumberland Senior Cup; Brooks Mileson Memorial League Cup and FA Vase and the agony and frustration for Woodhorn Lane supporters was being prolonged week after week – but no more. Over the past couple of seasons, RCA boss Martin Swales has assembled a more than useful side borne out this term with the Sunderland based outfit in Vase action early next month when they host West Auckland in the fourth round. Jack Butler and Zak Atkinson will claim the plaudits for Ashington being the two goalscorers on a perfect afternoon for football but the importance of a two saves by goalkeeper Conor Grant at the start of each half must not be overlooked. The first came a mere four minutes into the contest and was without doubt a game changer. Kyle Davis met a cross from the right from John Jury and his downward header was creeping just inside the upright when Grant – showing razor sharp reflexes – dived to his left to keep the ball out pushing it onto a post. Similarly, it was the woodwork which denied Butler at the other end with the game eight minutes old. The youngster produced a left footed snap shot from 20 yards which smacked against the post with ‘keeper RCA Scott Pocklington standing rooted to the spot. Aidan Hutchinson had an effort from a Jake Cunningham corner booted off the line then Atkinson seized onto a short back-pass, went around Pocklington but from a tight angle could only drive across the face of the goal. Ashington kept attacking and after Cunningham had stabbed over, the youngster delivered another corner which was again cleared from near the goal line. As the half entered its final quarter hour, the visitors were enjoying their best spell but they were rocked as the Colliers took the lead in the first minute of stoppage time with a goal of the highest calibre from Butler. The youngster cut through the RCA rearguard with a great pass out wide to Lee McAndrew and when the full back put over a measured cross, the incoming Butler – eight yards out - rose like a salmon before planting a bullet-like header into the roof of the net. RCA came out at the start of the second period all fired up and in the 49th minute, Grant prevented a certain leveller. Thomas McAloon and Davis exchanged a one-two which bisected the home defence but the former looked on as his shot was blocked by the ‘keeper. The half produced few chances but with 20 minutes remaining, the post was clattered for a third time during the contest when following a corner on the left, visting skipper Greg Swansbury’s right footer clipped the post and went behind. Butler had caused problems all afternoon running at the RCA defence and after another promising burst through, his finishing let him down as he ballooned the ball well off target. With quarter of an hour remaining, Bowey introduced Wayne Buchanan for his first piece of action after recovering from an horrendous injury suffered in only the second game of the season at Hebburn and the club captain received a great reception from the home supporters. Then five minutes from time, Atkinson netted his 11th goal of the campaign to ensure victory. David Edwards was the supplier of a pass which saw Atkinson time his run to perfection which put him clean through, take the ball wide of Pocklington then slide home from a difficult angle.